In a pinch? On the road? Is Fast Food an option for food allergic diners? For families with food-allergic children who participate in sports and activities, eating on the run becomes more common as the kids get older and are required to travel further away from their hometown. While many parents with food-allergic children pack snacks and meals that accommodate their kid’s food allergies, there are times when games get delayed, travel is further than expected, teams decide to go out to eat as a last minute celebration, or, strangely enough – kids just get hungry! With that in mind, we decided to take a look at where AllergyEats members stopped to eat when they needed a quick bite. We analyzed a selection of the Fast Food restaurants on AllergyEats to see how they fared with our members. 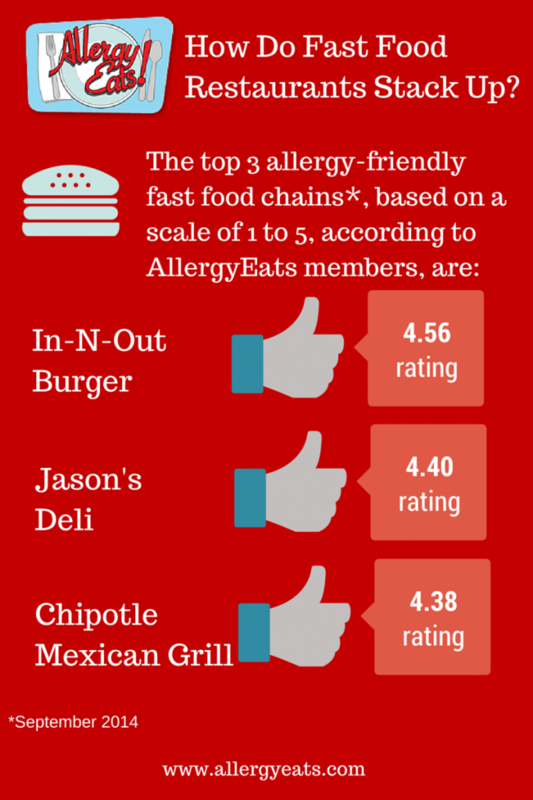 According to user ratings, three restaurants earned a 4 or better on the AllergyEats scale of 1 to 5. We looked at restaurants in both the Fast Casual and Fast Food category. For those outside of the restaurant industry, Fast Casual is a blend of fast food and casual dining – places like Chipotle Mexican Grill and Jason’s Deli. Unlike Fast Food chains, Fast Casual restaurants promote higher quality ingredients and do not have drive-through dining. For the sake of our analysis, we considered all the restaurants to be in the “Fast Food” category, simple because these venues are accessible and often reasonably priced, making them convenient choices for fast-moving families. Of course, families need to decide for themselves if they are comfortable picking a dining selection that isn’t necessarily deemed as healthy. However, sometimes hunger over-rides other concerns, especially when you are already contending with food allergies. If you are interested in a wider variety of food allergy-friendly dining choices, AllergyEats publishes a list of the most allergy-friendly restaurant chains according to our members in March of each year. While some chains are regional, many are widely spread throughout the U.S., allowing families with food allergies to build confidence that, if one unit/location can accommodate allergies and intolerances, then it’s likely – though not guaranteed – that a similar experience could be had at another location. Of course, it’s important to always ask questions about ingredients and food preparation, regardless of how many times you have been to a particular location or chain. If you have a favorite Fast Food restaurant that is not on the list or rated yet, please take the time to rate it. You can rate a restaurant more than once if you eat there frequently. In that case, the new rating will replace the old one, but all of your comments will remain in place. While it may take a few extra minutes to add comments, it is helpful for other food allergic diners to read reviews that contain meal suggestions and restaurant food allergy protocol details, such as whether or not a manager comes out to speak to diners or if sections of the kitchen are dedicated to handling food allergies. Overall allergy-friendly ratings are based on the average of individual members’ experiences so that our community can benefit from the collective wisdom of the crowd. How can a Fast Food or Fast Casual Restaurant BE food-allergy friendly? So, given our findings and the perspective on what makes a restaurant “allergy-friendly,” are you surprised by these ratings? Do you think certain fast food outlets are a reasonable option for food allergic diners? Do they work for your family – and why or why not? How is 5 Guys allergy friendly, don’t the fry their foods in peanut oil? I am totally shocked at Five Guys and Chick-Fil-A both being on the “allergy-friendly” list as both of these restaurants use peanut oil to cook their foods making the risk of cross contamination so severe that it is impossible for those with peanut allergies to eat any of the foods in the restaurant. The rating on Five Guys actually implies a very low-level of allergy-friendliness. 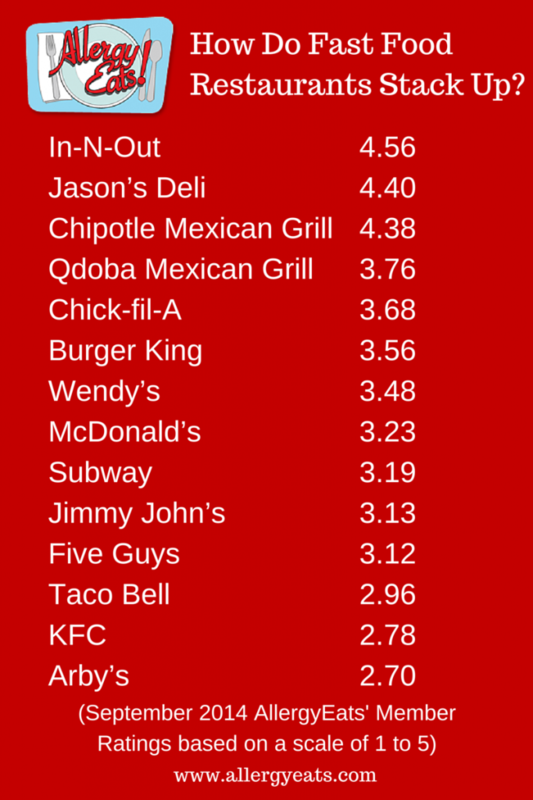 Chick-Fil-A is a little higher, but still somewhat below overall restaurant average. Recognize also that these ratings measure allergy-friendliness for people with any allergy, not just peanut. In general, restaurants that can accommodate one well can also accommodate others similarly. Five Guys is an anomaly given that they obviously cannot accommodate those with peanut allergies (1.3 rating on 1-5 scale), but they actually handle others well (the non-peanut allergy rating is a 3.9). This is all clearer when running a restaurant search on the core site, where the individual allergy ratings you check off are specified. Chick-Fil-A is more controversial as many with peanut allergies say they eat there safely due to the highly-refined peanut oil. I am not an expert on the peanut refining process so I won’t enter this debate, NOR WILL I RECOMMEND TAKING SOMEONE WITH A PEANUT ALLERGY THERE, but the point is I’m not sure it’s as cut-and-dry. Thus, Chick-Fil-A actually has a 3.3 rating from those with peanut allergies (not good, but not a skull-and-crossbones-type rating) and a 3.9 from everyone else. Hope that helps clear things up somewhat. I appreciate the discussion about how the knowledge of the business is just as critical as the presence of allergens. The bottom line is that staff must be able to communicate and understand appropriately. I like Shane’s Rib Shack for gluten-free choices. They have a g-free menu prominently posted, and when you order gluten free, they put it on the order very clearly. And, dang, does it taste good! I do not understand how Chili’s can make the list. After eating lunch at Chili’s in Columbia I developed severe stomach pain and then got sick. I called the restaurant to ask if they use MSG in the salad I had. Their answer was yes. I questioned why that info was not on the menu since you really don’t expect MSG in a southwestern salad. Many people are allergic to MSG. He also said it was in some of their other sauces, but didn’t know exactly which ones. I will not eat at Chilis anymore. Subway has told me they use the same baking sheets for cookies and the breads. They do not clean the baking sheets in between baking different items. This means cross contamination for tree nuts, peanuts, dairy and eggs. They do not clean the baking sheets in between baking different items. Agree about Subway. Managers at two different stores have told me that. So disappointed! the ice cream had egg in it and they definitely said it DID NOT….Well, after’a few bites, the grand-daughter eyes puffed up and she started to itch etc. Not sure how five guys is safe at all. They use peanut oil, and often even have peanuts in the store for the customers to snack on while waiting for their burgers. They even have signs on the door that warn people with peanut allergies not to enter. My son has multiple food allergies….milk, egg, peanut/tree nut, fish/shellfish, tomatoes, and sesame. As a child, I used to carry a bag of green beans, a potato, and Fleishmans unsalted butter in my purse to give to the chef and bring out with our meal. Still, we walked into McAlisters Deli one day, my sons throat immediately started to swell and we left, going to straight to the ER. (I tried an Epi but it shot the needle before I touched his skin-it’s a BIG needle). I’ve researched fast food because we are a one parent family on the go. McDonalds was our choice…up until a year ago when they began the buttermilk chicken strips….for about 4 years, 2-3 times weekly. Now my 15 year old son has high cholesterol, triglycerides, and other issues; at risk for diabetes and heart attack. I’m back at ground zero looking for “healthy” allergy friendly restaurants. I carry a chef’s card and that helps but we are trying our hand at meal prepping/planning for days at home. It is a constant battle and we would appreciate any comments or suggestions. I was told that Chik-fil-A uses peanut oil to fry some of their selections and then canola oil for others. Peanut is used for frying at higher temps so the bread chicken cuts for the sandwiches are done in peanut oil along with some other items.. And then the fries are in another fryer done in canola. Not sure how accurate this info from their employee is, however she said she also has food allergies and that it is hard for her to find stuff as well and offered that info. I will check into it and repost soon. I have just recently developed a peanut allergy, and had a relatively minor reaction to Chik-Fil-A and Zaxby’s. That’s why I’m here researching now. I hate to think McDonalds is my only option. My son is HIGHLY allergic to nuts/peanuts and we’ve eaten at Chik-Fil-A every week since he was 5 (he’s now 16). The peanut oil is highly refined and he’s never had a problem. When we first discovered his nut allergy at age 5 (before this he was a peanut butter sandwich fiend), we were sent to the Bloomberg Center at Johns Hopkins for education and further testing. We were told about refined nut oils versus ‘cold pressed’ nut oils. Refined nut oils do not posses the proteins that trigger 98% of nut-allergy victims. Burger King and McDonalds use a ‘vegetable blend’ (30 % peanut oil, 70% canola oil) for deep frying. Most restaurants are using peanut oil blends for frying (my step-son is a chef in D.C.), so you have most likely ingested peanut oil and not known it. The point being, peanut oil is not a problem. If there was an allergic reaction at Chik-Fil-A, most likely it could have been something else that entered the food chain that you are allergic to. My niece has Celiac’s disease and she cannot eat there because of the spice blends they use in all of their signature breading and sauces. They have ‘special blends’ of spices which they will not divulge, but whatever it is, it irritates her greatly. As easy as basic research is to do with Google these days I’m amazed at the level of uninformed plain stupidity that still exist. Highly refined peanut oil is does not contain the allergen. The FDA has approved it for use in food. Just like Milk, just like MSG, and there’s millions of people allergic to those. With millions of people served daily food that’s been cooked in the peanut oil, don’t you think they would have been sued? Shut down? If you’re the one that has the allergy, then it’s YOUR responsibility to ask the restaurant, email the company, do whatever you need to do. It’s YOUR RESPONSIBILITY. Also, just remember peanut allergies are not the ONLY allergies! These values are based on many allergens/foods, and the availability to order things without. Five Guys literally has peanuts all over the place and I was under the impression they used peanut oil. How are they on this list?